View Acutherm's wide range of Energy Efficient, Zone Independent, Therma-Fuser VAV Diffusers. DuctSox Fabric Ducting offers Innovative, Green Solution with Superior Air Distribution. Wide range of Atmospheric, Fire Tube (direct & indirect) and Condensing Gas Boilers. Thermal Buffer Tanks increase system capacity and stabilize return water temperature. Imera has a complete range of Membrane Expansion Tanks with sizes from 8 litres to 600 litres. Condensing technology enables significant savings both on new and when replacing existing systems. Storage, Buffer & Expansion Tanks; Auto Refill Units, Air/ Dirt Separators; Calorifiers, Dosing Pots. Our radiators are designed and manufactured in Europe to meet the highest International standards. 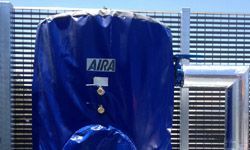 Wide Range of High efficiency Evaporative Coolers to suit any requirement. Wide range of gas, radiant and fan heaters to suit a number of applications. Save on energy with Entrematic’s Commercial & Industrial High-Volume, Low-Speed Ceiling Fans. ecoHVAC have a wide range of constant airflow regulators to suit your project. Aldes Zone Register Terminals regulates ventilation without the need for individual fans. Used in hospitals, operating theatres, clean rooms, gas fire suppression and fire routes. American Ultraviolet manufactures a wide range of UVC ultraviolet lights to suit numerous applications. Devatec's Steam Humidifiers are the perfect solution for your humidity problems. The Phase Checker is a Diagnostic Instrument for problem analysis of Inverter Air Conditioners. Comprehensive range of air curtains ideally suited to the Commercial, Industrial, Retail & Food Industries. Designed to give fast, accurate indication of differential air pressures. Control your Air Conditioner or Heat Pump from your Phone. Make your life comfortable & save money!